Silestone is a brand of building materials produced by Cosentino, who specialises in quartz worktops. Globally recognised, Silestone offers an amazing variety of “bacteriostatic” surfaces for interior design. The term “bacteriostatic” emphasises the fact that stone surfaces combat bacteria in several ways, promoting a healthy environment anywhere it is used. 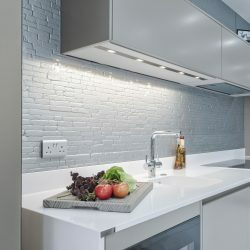 Some of the same properties that make stone worktops resistant to microbial activity make them an ideal work surface or wall cladding for kitchens and bathrooms, and since it is stone, it’s also durable, scratch resistant, and resilient; in fact, natural quartz is one of the top five hardest minerals that can be mined. Silestone has mastered the art of imitating more expensive stone options for interior design, architecture, furniture, and even expensive looking statues using quartz. Cosentino has a rich Spanish background, but the company’s UK headquarters are located in Hook, Hampshire; also home to Virgin Media, Serco, and Lenovo, to name but a few. In September of 2014, a 2.5 million euro Cosentino centre was built in Turkey, an illustration that the company is proud of its global presence and makes effort to maintain its status. Silestone as a brand can be found at any Cosentino centre worldwide, or can be procured by a private distributor with the appropriate licensing. The company has an aptitude for showmanship, which is exemplified by their ads. In 2011, one ad won a Gold Lion award at the Cannes Lion International Festival of Creativity, which gained notoriety for it’s surreal styling. Another strength for the company is that its products seem to be Marble or Granite, but are actually a combination of materials called an Aggregate, with Cosentino’s products specifically containing 93% quartz and resin. Considering that Quartz is the fourth hardest naturally occurring mineral (making it impervious to scratching, stains, or heat damage), the consistent nature of the product given it is created artificially, and it’s nonporous nature, the benefits are obvious. That there are also ingredients mixed into the base material that further prevent the spread of bacteria is an additional bonus. Silestone has the widest variety of quartz worktops, with names as beautiful as the surfaces themselves; they can also be made with other metals, minerals and pigments to produce shimmering slate in any colour a customer could imagine. Silestone slates come in three textures; namely, polished, suede and volcano. For volcano and suede textures, there’s less calibrating and polishing done to the slates, leaving them closer to their original forms. The volcano texture, which is visibly rugged, is designed for customers who want a more rustic feel to their workspace. When clean and dry, both textured options are bacteriostatic enough for kitchen counters, because they both are solid, smooth, stone slates.